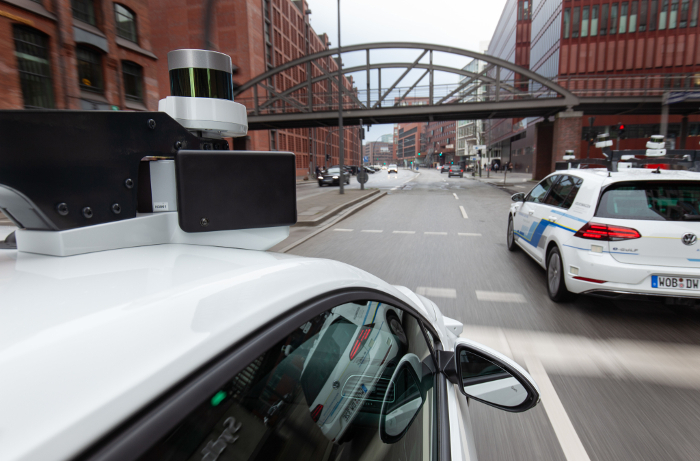 Volkswagen has begun testing autonomous vehicles (AV) in urban traffic in Hamburg, making it the auto maker’s first trial of highly automated driving to SAE Level 4 under real world driving conditions on public roads in a major German city. Operated by Volkswagen Group Research, a fleet of five all-electric e-Golf cars will be driving around a 1.8 mile-long (3km) section of the digital testbed for automated and connected driving that is being created in the city. For safety reasons, specially trained VW test drivers will be seated behind the steering wheel during all test drives in Hamburg to constantly monitor all driving functions and intervene in an emergency. The results of the test drives, which will be continuously evaluated taking full account of all data protection rules, will be incorporated in the Group’s numerous research projects on automated driving, and will test customer-centric services and optimize individual transportation. 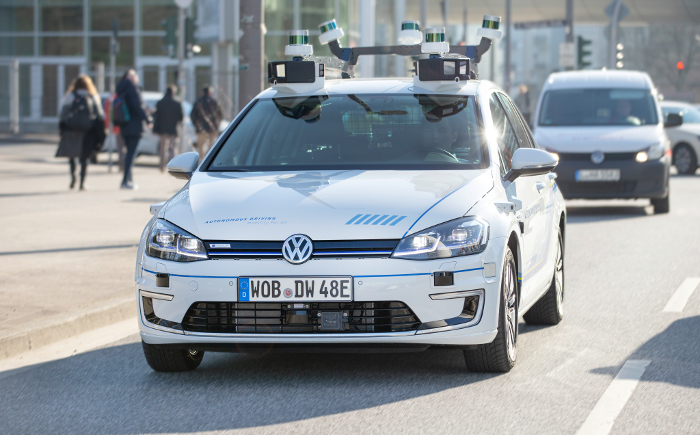 VW’s e-Golf test fleet have each been equipped with 11 laser scanners, seven radars and 14 cameras. Up to 5GB of data are communicated per minute during the regular test drives, each of which lasts several hours. Computing power equivalent to some 15 laptops is installed in the trunk of the AVs, which, when combined with state-of-the-art sensor technology, ensures that data on pedestrians, cyclists, other cars, intersections, rights of way, parked vehicles and lane changes in moving traffic are captured over the shortest distances and in milliseconds. Despite the diversity and complexity of the information, the artificial intelligence (AI) used in the vehicle’s software must register all relevant objects and respond to them without triggering any false alarms. Several different AI approaches are used, including deep learning, neural networks and pattern recognition. 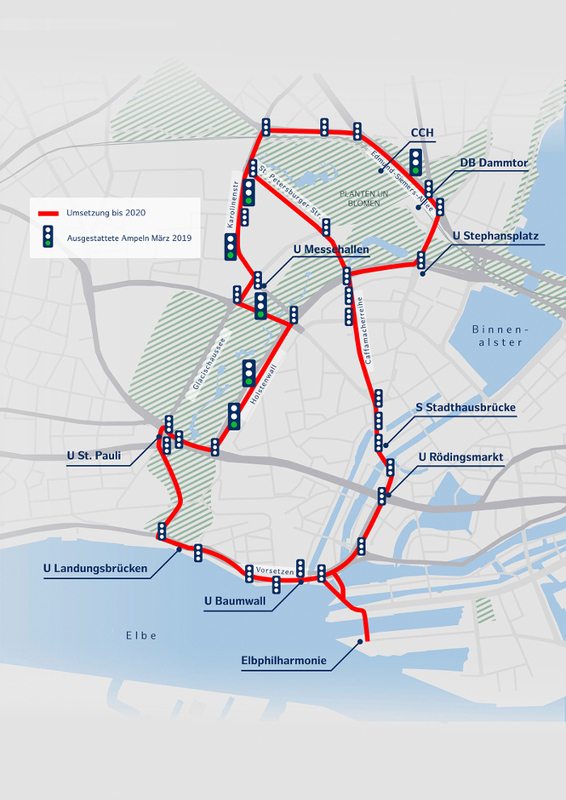 As part of its preparations as the host city for the ITS World Congress in 2021, a 5.6 mile-long (9km) digital testbed for automated and connected driving is currently being constructed in Hamburg, with completion scheduled for 2020. The city authorities are successively upgrading traffic lights with components for Infrastructure-to-Vehicle (I2V) and Vehicle-to-Infrastructure (V2I) communication. 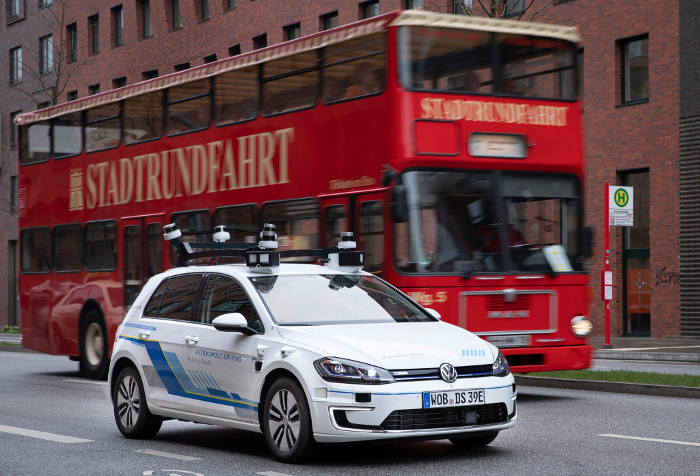 Volkswagen and Hamburg are taking a taking a major step toward further optimizing traffic flows through the use of digitization and onward to the full-scale implementation of automated driving in the city center.